Firstly we found out transfers this past week and I'll be staying with Elder Lewis for these next six weeks. This sadly signifies that my streak of having a new companion for every transfer has come to an end, but at least we both know the area! So we should get a lot more work done this next transfer. So Tuesday we were finding all day. Later that night, while Elder Lewis and I were finding in an apartment complex, we were going through our area book and this group of about five people were a ways off in the distance and started yelling at us and asking in a variety of ways if we wanted to fight. Now, I'm not one for unfairly matched street-fights and especially while in dress clothes and neither is my companion. So we promptly decided to start walking towards the opposite direction from them and they started running at us! Luckily a member lived within like twenty feet of where we were so we went to their house and banged on the door until they let us in. They were pretty confused as to why we were banging on their door late at night until we explained our reasoning for not wanting to go to the hospital that night. And that ladies and gentlemen is how we avoid fights as missionaries. So Thursday! We started with helping this dude move his stuff out of his house because he had a twenty-four hour limit before the apartment complex threw it all out. The house had been boarded up for the previous month because the guy was evicted. When the boards were taken off we found out that a group of home-less people had been living there at one point and had completely trashed everything that was possible to trash. The guy was soooo furious when he found out what happened. So that was pretty interesting. Then later we went on exchanges and Elder Rivero and I were in their area. We went to talk to this investigator they had. We met her outside of her apartment with her Mexican neighbor and her "Boyfriend". Her Baby-Daddy/Boyfriend ended up yelling at her and us for talking. About thirty seconds later the Mexican man, who had previously been showing the boyfriend a certain pancake mix and syrup, came up to us and told us to look at the knives he had as he pulled each individual one from it's sheath and flashed them around in front of us. He then proceeded to ask which one we wanted. We said that we didn't want any of them and we especially didn't want any of them in our stomachs. We went back to talking to the lady and the man pretended to "trip" and bring the knives very close to Elder Rivero and I. We told him we didn't want any issues and left. And that ladies and gentlemen is how we were threatened with being stabbed this week. Friday was Elder Rivero's cumpleaños and so we had dinner at a members house and they even bought him a cake! It was super cool of them and we all had an awesome time. Later that night we went to Sonic as well because half-price shakes and such. All in all this week was pretty dangerous, but we also had tons of awesome lessons! We also found a ton of people to teach and it was super lit. So yeah. 1. 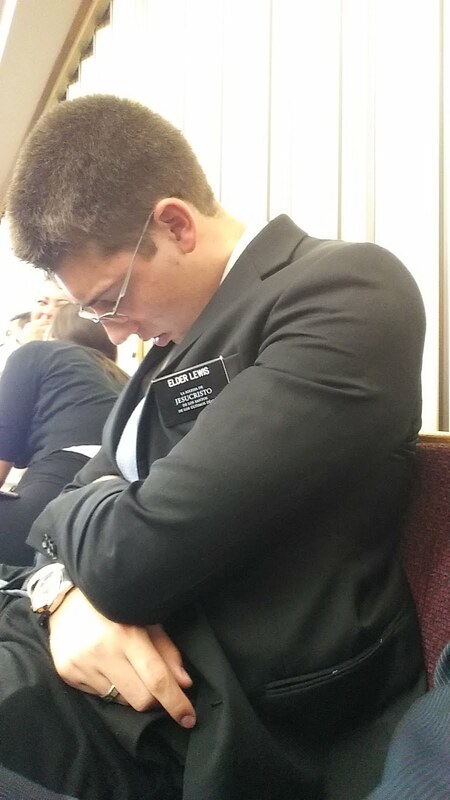 Elder Lewis falls asleep each Sunday in church so I took a picture!